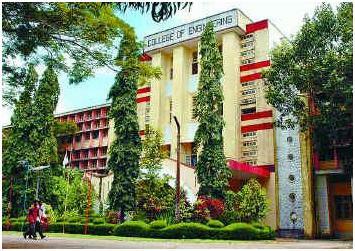 On the 3rd of July, 1939, amidst war rampant all over the world, the College of Engineering, Trivandrum came into existence. Then on the institution has grown and expanded steadily, making it not only the largest engineering college in Kerala, but also one of the biggest in the country. All the undergraduate courses under the college are ascribed by AICTE and are awarded ‘A’ or 'B' grade. The college campus includes facilities like, a big library consisting of more than 50,000 books including referrals, periodic, lending books and also a book bank, a central computer service, which is used by the postgraduate students and final year students in preparing project works. With the aim to cater to the needs of the students and employees of this college, a co-operative society was formed which started functioning from 1982 onwards. A Xerox machine is also available checking to the need of the students in a reduced rate. The society has an elected governing body functioning rather well. The college has a canteen functioning under a governing committee consisting of representatives from teaching faculty, non-teaching staff, students and PTA as well. A post office too functions in the campus between 9am and 5 pm. Then there is a branch of the State Bank of Travancore functioning in the campus between 9 am and 4 pm, with the transaction hours between 9am and 1 pm. The College has 1 boys’ hostel and 1 girls’ hostel which is located in very a beautiful and healthy location. Both the hostels have spacious rooms allotted to all students which provide comfortable and conducive atmosphere. These hostels have separate establishments and are headed by the Warden who is assisted by the Resident Tutors. The boys’ hostel has 240 rooms and can accommodate about 550 students while the girls’ hostel has 140 rooms which can accommodate about 300 students. The warden assisted by the Resident tutors is the admitting authority for the hostel. The hostel mess is run by the mess committee which is elected by the students and headed by the General Secretary, assisted by Mess Director and other members. The mess workers are also appointed by the student committee the salary of whom is also paid by the students. ‘KALPATHA’, the flagship event of the CET MBA addresses issues such as Team Oriented, Virtual, Collaborative, and Extended Enterprises, Acquisition, Engagement, Development, and Retention of Talents in a transient enterprise system to shape the Talent maps and grids to ensure enhanced returns. The fest is organized by Department of Business Administration, College of Engineering Trivandrum. ‘Robotics Club of College of Engineering Trivandrum’, is a club aimed in providing a tangible forum for discussing robotics. Dr G. Madhavan Nair- Chairman of Indian Space Research Organization,  ISRO and Secretary to the Department of Space, Government of India. Dr K Radhakrishnan- Director of Vikram Sarabhai Space Center, VSSC. Dinesh Venugopal-Head of Technology Development and IP Strategy,Mphasis. Pramod Kumar- Founder Director, TIME pvt. Limited.